"The researchers found that professionals receiving detailed feedback on a monthly basis outperformed all other groups involved in the study. Those receiving detailed monthly feedback improved performance on their key complaint measure by an impressive 46% relative to the control group over the course of the study." It is important to make the distinction between feedback and criticism. Feedback is information about reactions to a product, a person's performance of a task, etc., used as a basis for improvement. Criticism, on the other hand, is the expression of disapproval of someone or something based on perceived faults or mistakes. 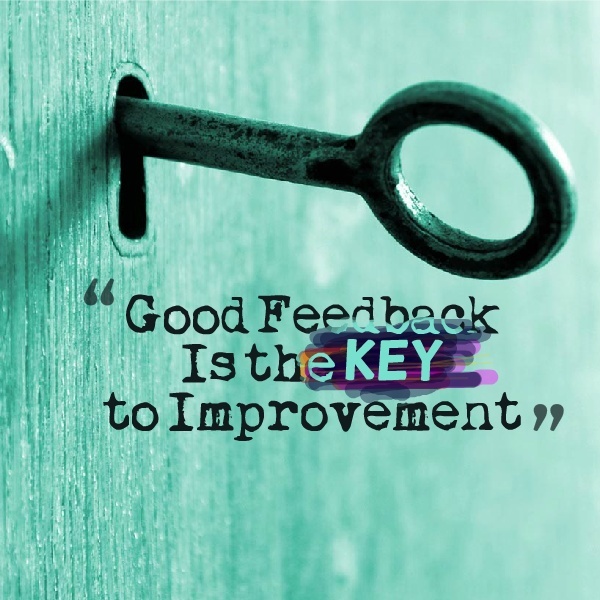 With growth being the end goal, it is important that feedback is delivered in a way that moves others to reflect on their work and take the necessary steps to get better. The above statement emphasizes the fact that we need to emphasize the “who” just as much as the “what” when it’s time to provide meaningful feedback for growth. Here are five components of feedback to consider in order for the process to be beneficial to both the deliverer and receiver. How you deliver any type of feedback will determine whether or not it is acted upon. The words that are used as well as body language can have an impact on how the message is received. Feedback shouldn’t just focus on areas of improvement. Consider integrating a few admirable elements that you observed and tie this into a much broader plan for growth. Reinforcing good work and practice helps in establishing a trusting relationship that will strengthen the feedback loop over time. Positive delivery also paves the way for the recipient to respond or ask questions to what you have said creating a positive feedback loop. The goal of feedback is to help someone right away. It should be focused on strategies that can be implemented immediately to help improve professional practice or learning. When I conducted post-conferences with my teachers I always integrated connections to research that supported my recommendations. This simple strategy went a long way to illustrate that the feedback was not only practical but also proven to have an impact. Aligning to learning criteria, standards, skills, or competencies can provide the specificity that many people yearn for when it comes to feedback. If the main goal is to use feedback as a catalyst for improvement then why delay it? This is one of the reasons why I don’t really like final exams. Students rarely receive good feedback that informs their learning as they are typically given these exams at the end of the school year and are then graded up until the last minute. Delaying feedback allows small problems to potentially fester into larger ones. The bottom line is that the more time that goes by the feedback that could have really made an impact will not be valued as much, if at all. If delivery of feedback is grounded in the first three points then consistency creates a culture committed to support, growth, empathy, and relationship building. This reason alone drove our learning walk process in my former school. Not only did we get into classrooms every day as administrators, but we also made the point to always provide non-evaluative feedback that helped to prepare our teachers for their numerous unannounced observations down the road. The use of student portfolios is another great strategy to provide consistent feedback aligned to standards and learning targets. More feedback is always better than less. Technology has impacted the way in which feedback is delivered. Even though it is easy to shoot off an email or text, these pathways might not always be the most effective depending on the situation or recipient. So much can get lost in translation when there is no eye contact, hearing of voices, or observations of body language. I am a huge proponent that there is no replacement for face-to-face communication when it comes to someone’s performance. Phone calls, live video, or establishing a time to meet on site can go a long way to ensuring that the message has its intended impact. Pause and think about the feedback you are going to give and the best medium to deliver it. It also goes without saying that prior to giving any type of feedback be sure your information is accurate and that the means of delivery reeks of sincerity. Sometimes criticism is disguised as feedback. As you think about how you give feedback, where have you found success? What components of good feedback would you add that I did not include above? Thanks in advance for providing me valuable feedback as a writer. I like your work Eric, I agree with you, and it is such an important area for school leaders to carefully consider, as a classroom teacher I would value feedback given in this way. Over the years I have seen leaders deliver feedback at times well, but many times poorly, through lack of forethought and the pressure of time. Possibly another important factor is the consideration of the audience. At times feedback has been given in public which should have been done quietly, or vice - versa. Those around who can hear the feedback being given can change the intended message merely by being an audience intentionally.... How does that adage go? Praise in public, criticise in private? In my opinion the element of respectful professional relationships is the most important key. You bring up some excellent points Carolyn about how the feedback loop can be improved. Respect, and trust for that matter, are crucial if feedback is to have a positive impact. Thanks for this post, Eric. Great read - really appreciate the practical approach. And I agree with Carolyn, there are too many bad examples of feedback conversations. In my opinion, getting good at providing regular, formative feedback to teachers is one of the few ways we'll ever be able to build a culture of continuous improvement among the teachers we support. Thank you so much for posting Eric! Outstanding information given because recently I have taking on leadership tasks and it is so imperative that you know and understand how to speak to people whether it good or bad information. Delivery is critical when talking to colleagues. I have seen many people crumble because of this very thing. Thank you for posting!! This information has definitely been helpful because I have been recently given a lot of administrative duties and with these duties difficult conversations will have to occur. It was wonderful to know that using the proper tools, I can deliver some difficult conversations and still have a positive outcome. Thank you so much! !